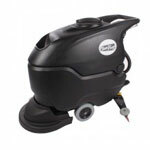 The Viper Fang 28T requires 2 separate squeegees on the back of the machine in order to vacuum up solution as you pass along the floor. The back and front squeegees are different in design, so make sure you order the right one for your machine. This one is a polyurethane blue and fits on the front of the squeegee apparatus. Since it is made out of polyurethane, it is a good all-around squeegee blade that can be used on smooth tile or concrete. Great for cleaning up tough dirt like oil & gas, and does a great job of standing up over time to chemical recovery. Please take a look at our complete line of auto scrubber squeegees for additional sizes and colors.